I have a question about the end game phase. At what point is it enacted? It was time based and up to the server op to modify. Default based on https://github.com/AlexHayton/NS2Combat/blob/bbc9815e3bca621286e5fa8f70d6f6f9e0969fb4/output/lua/combat_ModSwitcher.lua#L20 have been 25 minutes but iirc I lowered it on my server to 20 minutes. Quick update. I've start working heavily on the alien team. I created an "auto cyst" feature for the alien hive. It's largely based off the bot commander and works off RTs at the moment. The idea is that, though gorges will be able to place cyst chains (and cysts will be free, like marine power nodes are free), the hive will, at a slow rate, spread infestation automatically. I did not want it to be too tedious for the gorges to have to place every cyst on the map. Time lapse GIF below. So this is going to be played on full maps? Which purpose do the cysts serve? Will there be RTs? No, the intention is not to play full on maps. I just have to do that now for testing. If anyone has an old combat map I could use for testing that would be awesome. I was going to mod the tram at some point to remove the right lane from the map to make it smaller. Just sticking to to code for now though. The point of cysts are to spread infestation like in vanilla. No plan for RTs at the moment. Not in this mod (but I'd like to make the RT version as a spinoff of this once this is done). However, as in combat standalone and in this mod, you can build structures. Aliens have to build structures on infestation... cysts generate infestation... I could always make it to where alien structures don't have to be built on infestation, but that wouldn't be very alien would it. I could make it to where structures generate their own infestation, but that's more work and I quite like the auto cyst feature. If you need combat maps, I recommend looking on the workshop. There should be tons there. Can I recommend applying the cysts infestation spread code to all structures a gorge can build but to a much smaller area, so they provide their own infestation? thus negating the need for cysts at all? I like players dropping there own buildings idea, reminds me of the Quake2 Gloom mod or Tremulous. I'll try this out. I think it might be the way to go. If anyone has an old combat map I could use for testing that would be awesome. Thanks guys. I'll try to get one of them up and working so I can ditch tram. My biggest issue with combat was it rewarded good players and punished bad players. this resulted in new players having an awful time. XP being awarded for kills imo puts off new players. I think the nemesis xp bonus would be a great addition to balancing this. I think having the rt aspects of ns2 vanilla which generates pres whilst still maintaining the lack of commanders might be the best route. Did it punish bad players? From what I remember back in NS1 it used to level everyone up to a base as the game progressed so you will get XP if you are slagging behind. Is that what the nemesis xp was? Yes, there was a latejoin XP plugin. You also got XP when you were nearby a teammate making a kill; basicly stealing part of that player's earned XP. What i meant by this is that a good marine will keep gaining a benefit over a bad alien. The alien will keep dying and gain upgrades far slower than the good marine who is being rewarded for his individual skill were as the alien is sort of being punished in the fact that the marine is gaining upgrades quicker and quicker. In ns2 a bad alien on a good alien team is benefiting from the team as a whole, where as a a good marine on a bad marine team is forced to upgrade at the speed of his team. Yes, but slow. I was in the middle of a move the past couple of weeks that consumed all my free time. I've also been struggling with, conceptually, the alien buy menu. I think I have some ideas worked out now and I started getting back at it yesterday. Hopefully some updates to follow soon. What were you thinking about doing with the alien menu? My take on it would be something like the normal buy menu however you have to buy the upgrade 3 times to get the full upgrade chamber effect. Or just once but it costs more meaning it would take more time to get an upgrade at first. Gorges would have extra options for dropping things like crags, shifts, whips and such. Honestly cant wait to see what it looks like. @skav2 I was originally going to reuse the original assets and concept behind the vanilla evolve menu. In addition to the normal upgrades, I was thinking about letting the player also select the abilities and those would also move down into the evolve circle. I decided I didn't like this approach. Now I have a section at the top that shows the current evolution (lifeform, upgrades, abilities). 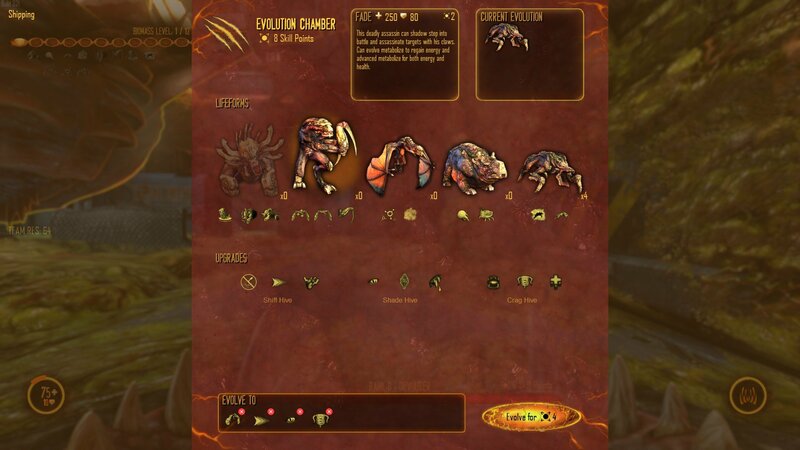 A section to pick a new lifeform, a section to pick upgrades, a section to pick abilities, and a section at the bottom that shows the resulting evolution. I think that, regardless of the layout, the alien buy system needs to be a queue "shopping cart" style system to avoid unnecessary evolves if you're doing more than one upgrade. I'd like to eventually have a user option that for both Marines and aliens, allows the user to choose which approach they use. Quick buy vs Queue. Anyway, the GUI work is tedious which is why it seems like there is no progress at the moment. I agree with what you mean about the queue style so it can all be done at once. There might be other modders willing to help you get things done faster and/or take up certain tasks so that you can focus on other components. You should join #modding in the NS2 Discord. I'd like to get the community involved. I'll check that out. Before I get people to start contributing, I need to get the code base cleaned up a bit. I want to refactor the no commander parts into a base mod (I plan to do the "ns2 with no commanders" mod approach after this) as it may overlap future mods. I also need to refactor the upgrade code into something more manageable. Right now they are kind of just hacked in there. Once that's out of the way, I'll definitely be looking for some help to really speed this thing along. I'll hopefully have a screen shot of the Alien buy menu by the end of the day today. Here is what I have so far for the Alien Buy Menu. I still need to do most of the validation and I need to finish the "Current Evolution" section. I also need to account for prerequisites still (like meta before adv meta), but, I've made quite a bit of progress and I'm starting to like how its turning out! HELL YA! I'M UNCOMFORTABLY ENERGETIC ABOUT THIS! Looking good! Any updates since then? Thanks! Its definitely coming along. The play test was super helpful. Helps to identify issues that I would have never seen just testing with bots. It's looking amazing. Really looking forward to seeing it progress!